Eventually I'll win her over…if my past doesn't ruin everything first. 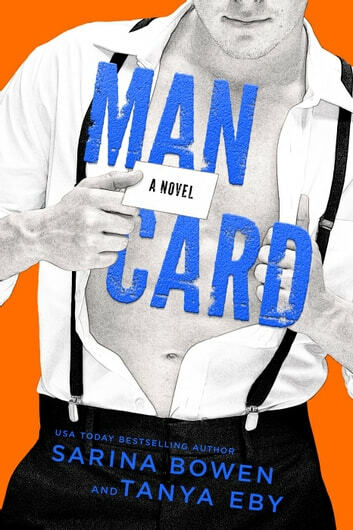 Man Card by Sarina Bowen & Tanya Eby is the second book in their new Man Hands series. Hilarious to the point of laugh out loud funny, this book is also very emotionally engaging. A deeper emotional layer that finally lets you get a peek behind the brave and confident facades of Ash and Braht. Braht's had the hots for Ash since he first set eyes on her. Ash, however, wants absolutely nothing to do with Braht. He is infuriating and annoying and entirely too good looking to be safe to be around. When it turns out that no matter what Ash does, Braht is always around, she begins to crave his presence. With a continuing time line from book one a plenty of interactions with the beloved secondary characters I really can't wait for the next book in this series. Enjoy! One of my absolute favorite books of 2017 was Man Hands so I was beyond excited for Man Card. While Man Card was hilarious, I felt like it had more emotion than Man Hands. There were definitely points that I was laughing so hard that I couldn't read the screen but there were also parts that I was tearing up and devastated. Ash and Braht have been through a lot and the people they show on the outside don't even come close to showing how deep their characters run. I love a good enemies to lovers story and this book hit all of the things that I love about this trope. Arguments, fiery passion, one-upmanship, and competition. Ash and Braht were absolutely perfect for each other, even if it felt like it took them forever to figure it out. I lost hours of sleep on this book and every single second of that was worth it. I LOVE this series so much and I can't wait to see what's up next! !